Reading between the frames to give you the bigger picture. One of the most infuriating myths peddled as received wisdom by arm-chair Nick Robinsons across the nation is that protests never change anything. The second most infuriating un-truth they then point to, to justify this is pessimism clothed as realism, is the historic Stop the War march of 2003. Because the war in Iraq still happened, and Britain still took part in it. So there you go, over a million ordinary people rallied to defend the unseen lives of millions in Iraq, and it was pointless. Might as well buy shares in BAE systems and put your feet up. War, huh, what is it good for? 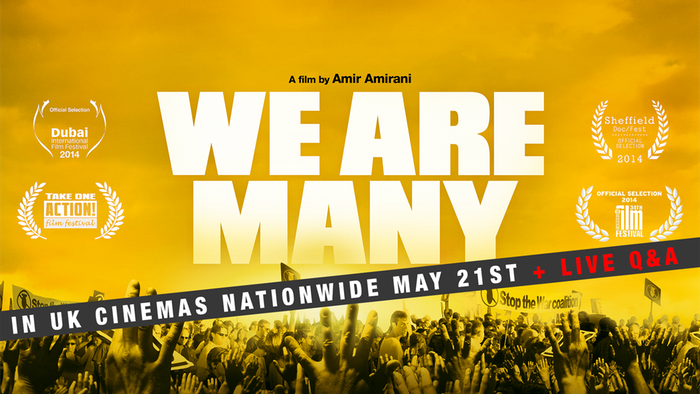 We Are Many (2015), Amir Amirani’s moving tribute to the unquantifiable millions who marched on February 15th is perhaps the most compelling antithesis to that hackneyed lie. Not only does this landmark documentary, over 9 years in the making, comprehensively catalogue the years, months, weeks and days leading up to the march; as well as the march itself, the subsequent votes for war, and the invasion of the war in Iraq, it moves beyond that. Beyond the shallow confines of a history written by the victors, and beyond the stories perpetuated by the coalition of willing murderers who crow that they won the day, Amirani’s compilation of footage and interviews venture into life after that defeat. Initially, that means delving into the void; a pitch black well of despair, in which we are confronted with erratic and unverifiable estimates of civilian casualties, ranging from 600k to over 1million. A despondent realm where the weight of global public opinion could do nothing to prevent a host of supposed liberal democracies causing those 1 million tragedies. This comes so close on the heels of such a beautiful day for humanity. After we witness the bravery of activists across the globe, from the men who painted the Sydney Opera house to read “No War” to the Antarctic researchers willing to lose their jobs to make a statement for peace against the snow. After the intensely evocative showing of public determination in the United States and in Britain particularly – so powerful it even moved the usually collected national officer of Stop the War, John Rees, to tears – Blair, Bush and co.’s campaign of parliamentary coercion to commence shelling bring us back down to earth with an agonising thud. And while former government stooges Falconer and Blunkett are present in the film to gloat over their shameful Parliamentary “victory”, it is Benn’s statement that undeniably wins out. Amirani’s footage unflinchingly documents the details of the defeat, don’t imagine for a second he skirts around that to paint a rose-tinted picture of unstoppable people power, but by the end he builds an undeniable case that that day really shook the world – and has changed the game for the rest of what we have seen of the 21st century. First, out of the ashes of the initial shelling of Basra, we see the beginning of protests in Tahir Square. The movement that would flourish into the Egyptian revolution was born out of a feeling of impotence regarding the war – and the dictator, Hosni Mubarak’s unwillingness to allow Egyptians to truly join the initial day of action. And two years after the ousting of that regime, back in the UK, we see a government, once more determined to drag an unwilling population into a Middle Eastern war, defeated in Parliament. David Cameron’s government were unable to galvanise real support for invading Syria in 2013, even in the House of Commons, the place where shady deals and political manoeuvring are supposed to over-ride the will of the people. Such was the fear of another mass mobilisation, as protests against that war grew daily, that we really did Stop the War. Moving forward, this gives us something even more precious; optimism that we can do it again. We can, and we must keep fighting to win, as governments across the globe align once more, drawing the battle lines for a very different kind of war. A war on trade unionists, a war on women, on the disabled, on the homeless and unemployed, a war upon the rights of every race, class and sexuality. It will be a war on all the supposed ‘inconveniences’ that stand in the way of their propping up of a system of war and theft in the name of profit. We must continue to mobilise, for the sakes of millions at home, as well as countless billions we have never met abroad, in the name of solidarity, peace and equality. Even with the backdrop of the Iraq war, We Are Many gives us hope that we can. Considering the pitch-black historical context, that isn’t so much pulling a rabbit from a proverbial hat, as performing cinematic alchemy – but We Are Many pulls it off! By the end of the film, regardless of the disgusting calm with which Blair, Rumsfeld and co. still excuse their illegal war, it is clear that while they may have won the battle – the future history of humanity suggests we can still win the proverbial war. This entry was posted in Review and tagged 2015, day of action, iraq, john rees, protest, review, tony benn, war, we are many by Jack Brindelli. Bookmark the permalink. No I won't back down. All views are those of the Womens Institute, Kensington branch.